There’s been a lot of questioning over the years about Sniper Joes, who designed them, and their relation to Blues. Part of that I’m sure is my fault, because I remember goofing it a few times a while back (I’m talking years and years ago, back when I thought a year or two of Japanese study qualified me to be a translator) with some of my much earlier and sloppier translations I did for Mega Man Network and Mega Man PC in their early days. As long as I’m playing catch-up this week, I thought I’d throw in a fix for some decade-old hubris of mine as well. Dig in! Dr. 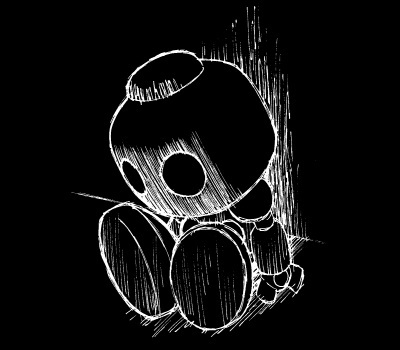 Right originally designed a mass-producible type of humanoid robot; the Joe Series are what happened when Dr. Wily remodeled it for combat purposes. Joes return, this time with a super-strong power up. Never giving up, this time they think they’ll get Rockman for sure. 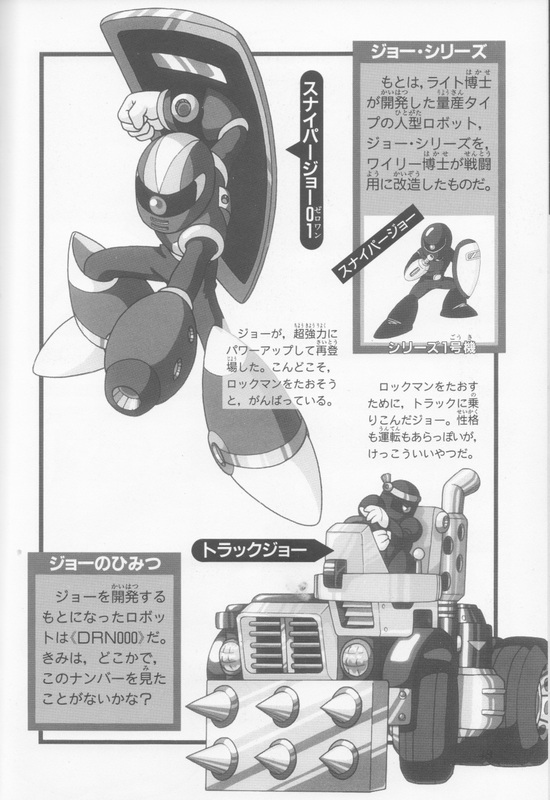 A Joe that’s gotten behind a wheel of a truck to defeat Rockman. Their personalities, like their driving, can be a bit rough, but they’re actually not such bad guys. The robot who became the basis for the development of the Joes is «DRN.000». Perhaps you’ve seen that serial number somewhere before…? Not entirely clear, but it has more details than most passages on the subject. You may remember, Blues is DRN.000, and was developed by Dr. Right as a prototype humanoid robot. Wily found Blues and remodeled him as a battle robot, and through that process learned the secrets to making robots like Dr. Right’s. Thus, Wily created Sniper Joes in Blues’ image. Or, something like that. On a related note, I like how Joes are portrayed here as the likable underdogs of the series. They work hard to do their creator’s bidding, but in the end even they must know that they’re just cannon fodder. I liked the fancy Joe Zero-One design, it’s too bad it only ever appeared in Rockman 7 and Rockman Battle & Chase before it went out of style, replaced by the more traditional “Joe Classic” look. 2 Comments to "Not your average Joes"